This manuscript is called the Winchester Psalter, or the Psalter of Henry of Blois, and was made c. 1220-1229. 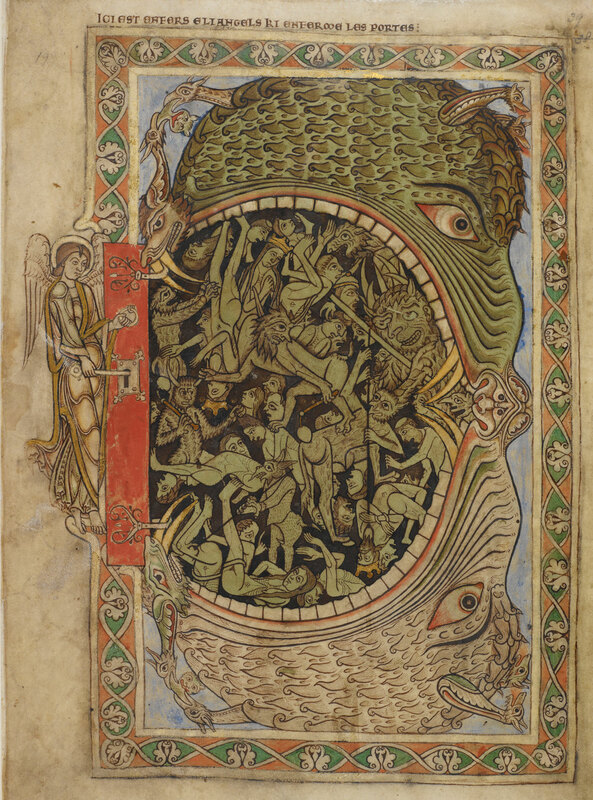 The image depicts the mouth of hell as a dragon or other monster, with demons pushing sinners into the monster’s mouth. The angel prepares to unlock the gates of hell, as in the Harrowing of Hell. The Harrowing of Hell is a story about Christ descending into hell between his crucifixion and resurrection to save all the righteous people who had been born since the beginning of the world but before the incarnation of Christ. The story first appeared in the apocryphal Gospel of Nicodemus.